We will be closing early (12:30p) on Friday April 19. Have a wonderful Easter weekend! Tomahawk is a recognized leader in the industry. Our trademarked "Energy Log" construction system offers all the beauty and aesthetics of a full log home with no settling, no air-infiltration, no slip-joints, and no twisting logs! Conventionally framed, fully insulated walls covered in hand hewn, kiln dried half logs provide your home with increased energy efficiency and greater design flexibility. This hybrid construction system allows you greater flexibility in exterior and interior designs, Mixing a variety of finishes both inside and out allows you to create a custom log home that fits your desires. From your initial ideas to the final details the staff at Tomahawk will take care of every detail. Assisting you throughout the design and construction of your log home is what we do! Log Homes are custom homes. We invite you to view our log home photos and log home plans to begin gathering ideas for your new home. Custom designing a log home specifically for you and your family is what Tomahawk Log Homes takes great pride in doing. The Tomahawk Log and Country Homes Design Guide is the perfect place to start the log home design process. 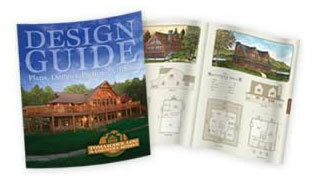 The Design Guide contains 90 beautiful log home floor plans complete with log home photos. Order toll-free at 1-800-544-0636 or click here to view sample pages and order on-line. The warm and inviting interior of a custom log home. Tomahawk Log & Country Homes looks forward to turning your dreams into reality.